Every voter has exactly the same amount of power, regardless of his preferences. Voters are not split by multiple candidates with similar platforms. Voters who do not like any of the candidates are not disenfranchised. Voters who like more than one candidate are not disenfranchised. The system has no bias for or against any candidate. The number of candidates running does not matter. A candidate cannot affect the outcome of the election by entering or leaving the race, unless he wins the election when in the race. Because of this, no signatures or petitions are necessary to get on the ballot. Because candidates can't hurt each other by running, no primary election is necessary. No runoff election is necessary, unless a tie occurs or no candidate gets a positive score. Negative campaigning will end, because voting against one candidate doesn't automatically vote for another. There is no such thing as an overvote or an undervote. Voters can always vote their consciences. Voters do not have to abandon their favorite candidates to prevent their worst choices from being elected. The system can also be used for fair at-large elections. The system can also be used for fair referendum elections. The system can be used in a fair form of electoral voting (see below). The system can be used in a fair form of proportional representation voting (see below). The system can have a way to eliminate nonlegislative offices built into it. 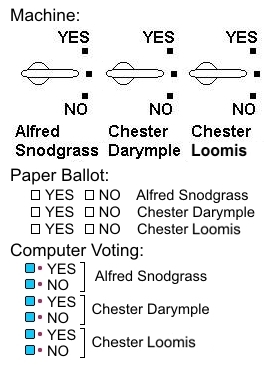 Independent Voting works equally well on any type of ballot: paper, machine, computer, or mark-sense. Congress uses it for its internal votes (sort of). Independent Voting always chooses the choice that pleases the most voters. The Independent Voting System refutes Arrow's Theorem. Arrow's Theorem: "No voting system satisfies all fairness criteria. The Independent Voting System does satisfy all reasonable fairness criteria because it does not use ranking. The Independent Voting System refutes The Gibbard-Satterthwait Theorem. The Gibbard-Satterthwait Theorem: "No voting system is immune to strategic (insincere) voting. Strategic voting is useless with Independent Voting because each choice is voted on independently. The Plurality, "first past the post", or "Vote for only one", election system currently in use in most places has NONE of the desirable properties listed above. Anyone who is legally eligible to vote must register before each election. The election board must photograph the voter. The election board checks the ID, photo, and residence of each voter. The election board mails the required photo voter card to each validly registered voter. The correct polling place, the election date, and the photo must be on the voter card. The voter must bring the registration card to the polls. Election officials must check the voter card photo against the voter's face. The card must be punched by election officials when the voter votes. No election card that is already punched can be used in a general election. No election card that is not punched for the main election and all previous runoffs can be used in a runoff. More punch places are provided for each runoff. Each runoff election has another punch position. Anyone who is legally eligible to hold the office can enter the race. There shall be no primary election. Any party with interest can add a referendum, or add a choice to an existing referendum. The filing fee for a candidacy or referendum shall be less than a day's minimum wage. The filing deadline shall be one month before the election. Each candidate or referendum Choice has one ballot position. Each ballot position has selectable entries for both YES and NO. If a voter makes no selection in a ballot position, or selects both YES and NO (on a paper ballot or a two-button machine), an ABSTAIN vote is recorded. ABSTAIN is the default vote if the voter does nothing for that Choice. There is absolutely NO interlocking between one ballot position and another. No combination of voting selections is disallowed. Since more than one candidate from each party can run, there will be no straight-party selection. The voter is allowed to make exactly the choices he wants. Each candidate or referendum Choice is hereafter referred to as a "Choice". The YES votes for the Choice are counted. A voting machine can keep a running total. The NO votes for the Choice are counted. A voting machine can keep a running total. The number of NO votes is subtracted from the number of YES votes using integer arithmetic, producing the Score for the Choice. If more NO votes than YES votes are counted, the Choice has a negative Score. The voting machine can also keep a running total of this with increment-decrement counters that can handle negative numbers. The Scores of the Choices are entered into the tally board. All Choices with negative or zero Scores are removed from the election process at this point. If one Choice has a unique highest positive Score, that Choice is elected. If more than one Choice has the same highest Score, the runoff procedure below is used among only the Choices having that same high Score. This would be extremely rare. If the election is for an administrative office, and every candidate had more NO votes than twice his YES votes, the office is abolished. If the election is a referendum, no change is made to the current law. If someone challenges the tally legally, the runoff procedure is held among all Choices with positive Scores (instead of doing a recount). The one doing the challenge shall pay for it. If proof of voter or official election fraud or a ballot printing or programming error is demonstrated, all tallies of all candidates in the affected races shall be kept secret, and a revote on just the affected races shall be taken one week after the election. No Choice that received a negative or zero Score can be a Choice in any runoff, unless a ballot error existed. The runoff election is exactly 2 weeks later. If evidence of fraud was discovered, any party may post extra inspectors who look for fraud. The voter card must be already punched for the main election and any previous runoffs, or the voter shall not vote in the runoff. No voter may join the process at the runoff stage. In a legislative, executive, or judicial race, the runoff procedure is repeated every two weeks until someone wins the election. An administrative office is abolished if no positive Scores occur in the runoff, regardless of whether any candidate had fewer NO votes than twice his YES votes. No challenge may be filed on the results of a runoff unless proof of fraud is shown. * = It is obvious that no majority wanted any of the current candidates. The above ballot is mark-sense, but the system will work with most voting equipment. This includes paper ballots, lever machines, electronic machines, touch screen, and punch card. Notice that you can vote for or against more than one candidate, and that parties can run more than one candidate. Independent voting is designed to choose, among all possible outcomes, the outcome that pleases the largest number of voters. The Independent Voting System is well worth adopting. It will provide a better selection based on public opinion than any of the current systems do. See the special procedures for at-large elections, electoral elections, proportional elections, and numeric elections farther down this page. Use the Regular Independent Voting System election above. If the office has n seats, indicate that on the ballot. But the voter is not restricted to voting for n choices. The n choices with the highest positive scores are elected. If fewer than n choices have positive scores, use the regular runoff process above, but make sure that enough choices are on the ballot, and elect only enough choices to fill the remaining empty positions. Consideration should be made for proportional representation instead of at-large representation. Proportional representation usually fits public opinion better. The election ballot is made and conducted in exactly the same way as in a Regular Independent Voting System election. Note that the votes counted in each representative and senatorial district are votes for the electoral office, not votes for the representative or senator. The districts are used to tell which tally the votes count for. All of these counters are set to zero at the start of the tally process. When the YES and NO counts are taken for each precinct, they are taken in the same manner as the counts of the Regular Independent Voting System election. But no Scores are calculated yet. The counts are entered into the Precinct counters. The YES and NO count results for each Choice in each precinct are added to the counters made for the legislative representative district serving that precinct. The same precinct results are also added to each set of counters made for each senatorial district serving that precinct. The tallies for each representative district shall now be scored. Find the Score for each Choice as is done for the Regular Independent Voting System election above. But do not eliminate Choices with negative or zero Scores at this time. Sum the Electoral Votes so produced into the Electoral Vote counters. The tallies for each senate district shall now be scored. Find the Scores for each senate district. Find the Limit by counting the number of senators in the district. The number of senate Electoral Votes allowed shall be the Limit. For each Choice, find the Score Magnitude by finding the Absolute Value of the Score. For each Choice, find the Quotient by dividing the Score Magnitude by 50, using integer division. Discard the remainder of that division. For each Choice, find the Difference by subtracting the Quotient from the Limit. If the Score is positive and the Quotient is greater than or equal to the Limit, a number of YES Electoral Votes equal to the Limit shall be entered into the counters for the Choice. If the Score is positive and the Quotient is less than the Limit, a number of YES Electoral Votes equal to the Quotient shall be entered into the counters for the Choice. A number of ABSTAIN Electoral Votes equal to the Difference shall be entered into the counters for the Choice. If the Score is negative and the Quotient is greater than or equal to the Limit, a number of NO Electoral Votes equal to the Limit shall be entered into the counters for the Choice. If the Score is negative and the Quotient is less than the Limit, a number of NO Electoral Votes equal to the Quotient shall be entered into the counters for the Choice. A number of ABSTAIN Electoral Votes equal to the Difference shall be entered into the counters for the Choice. If either the Score is zero or the Quotient is zero, A number of ABSTAIN Electoral Votes equal to the Limit shall be entered into the counters for the Choice. The Electoral Votes for each candidate shall be scored just like regular votes in the Regular Independent Voting System election above. The winner is now computed as in the Regular Independent Voting System election above, using the tallies from the Electoral Votes. The runoff procedure is the same as in the Regular Independent Voting System election above, except that nobody may challenge a precinct tally unless it can affect the winner of the electoral tallies by itself. Winner-Take-All electoral voting in a state or other district is unfair, and is not allowed. The tallies shall now be scored. Find the Score for each Choice as is done for the Regular Independent Voting System election above. But do not eliminate Choices with negative or zero Scores in this process. Instead, remove all Choices that received no YES votes. Find the remaining Choice with the most negative score. Add this number to all of the Choices' scores to find their Partial Numbers. Find the sum of all of the Partial Numbers. Divide the sum of the Partial Numbers so found by the number of votes in the chamber to get the Reduction Ratio. For each Choice, divide its Partial Number by the Reduction Ratio, giving the Selection Number for that Choice. Round each Selection Number to the nearest integer, giving the Index Number. But if any Choice receives zero as an Index Number, replace it with a one. Find the sum of the index numbers. If the sum of the Index Numbers does not now equal the number of votes in the chamber, adjust the sum in the correct direction by changing the rounding of the Index Numbers of the Choices with Selection Numbers closest to the .5 rounding point. But again, such changes must not produce an Index Number of Zero. In this example, the body has 6 seats and 104 votes. A. Give each Political Party one column. B. Arrange the Choices into the columns under their Political Parties, one per row. C. Put each Index Number with its Choice. E. Sort each column's rows according to the Index numbers of the Choices, with the greater numbers at the top. F. Sort the columns according to the sums of the Index Numbers of the Parties, with the greater numbers on the left. Note: If several parties have the same sum of Index Numbers, Sort that subgroup of parties according to the highest candidate Index Number found within each Party. Going across, row by row, from left to right, and from top down, count off the number of seats in the legislative body. Seat the Choices counted off. Skip any empty cells when counting, so each count has a Choice attached to it. G. Count off, left to right, and going down by rows, the 6 seats in the body. H. Throw out the remaining candidates. I. Evenly distribute the remaining units in the column, distributing the ones that won't evenly divide by starting at the top. J. Evenly distribute all of the units in the column, distributing the ones that won't evenly divide by starting at the top. If the number of Choices on the ballot is less than the number of seats, or the number of Choices receiving YES votes is less than the number of seats, the remaining seats are filled in a runoff election with none of the original Choices allowed to be on the ballot. If the number of seats is less than the number of Parties (columns), each unseated Political Party shall choose which seated Choice or Choices to give all or parts of its Index Number units to. J. The unseated Political Party chose which seated Choice or Choices to give all or parts of its Index Number units to. The final Index Number of each Choice becomes the number of votes the Choice has as the seated proportional representative. An alternative to proportional representation is increasing the number of districts. If the value to be found is a real value, at least 10 Values, evenly spaced, are placed on the ballot in numerical order, with each Value being a Choice. If the value to be found is an integer value, the values to be selected among are placed on the ballot in numerical order, with each Value being a Choice. This system shall not be used to set speed limits or other values that should be set by sound engineering practice, not politics. Before the election, if any person objects to a Value not being included on the ballot, and the Value is a legal one to be considered, the number and distribution of Values on the ballot shall be changed so that all the original Values, the added Value, and sufficiently more Values to make all of the Values equally spaced, are all on the ballot. The election is conducted in exactly the same way as in a Regular Independent Voting System election. The voter votes Yes on all Values within the range he likes, No on all Values he will not accept, and abstains on the rest. The tallies shall now be scored. Find the Score for each Choice as is done for the Regular Independent Voting System election above. The winner is computed as in the Regular Independent Voting System election above. If two real values next to each other tie as co-winners, the actual value shall be the average of the two values. If a runoff election is indicated due to a lack of a positive Score, the list of numbers used in the runoff shall be found by finding the midpoints between adjacent numbers, and then adding zero to the list. If the runoff fails to produce a winner, the result shall be as if the election never took place. Any tax or new salaried position shall cease to exist. Any existing salary shall continue at the same rate. And any proposed numerical limit placed on the public is repealed. Also check the procedures for legislative votes for budgets below. Note that, in each example case, the third item is voted down. Vote on the item using the Independent Voting System. If the item passes the vote, add it to the budget. Stop when the next item costs more than the amount of unappropriated money left. Procedure Two - Priority by scores of items. Take an Independent Voting System vote on all of the essential budget items. If the vote spends more than the available budget, stop, and use the trimming procedure below, otherwise continue, using the remaining unapproproated money as the available amount. Take an Independent Voting System vote on all of the optional budget items. If the vote spends more than the available amount, stop, and use the vote removal procedure below, otherwise stop. Find the total amount voted to be spent in this portion of the process. Divide the available budget by the amount voted to be spent, producing a fraction. Multiply all of the budgeted amounts by the fraction obtained above. This reduces appropriations on all of the essential items by the same percentage. None of the optional items shall be appropriated, since the money is gone. Find the optional item with the smallest score. Subtract that score from the scores of all of the optional budget items. Remove the appropriations of all of the items with zero or negative scores. Stop when the budget is not overspent. * The following must be considered as not essential and unnecessary: the arts, sports, entertainment, recreation, museums, monuments, memorials, statues, fancy architecture, parks, trails, swimming pools, ice rinks, bicycle paths, and utility systems. Enter each alternative into the vote as in an Independent Voting System election. Vote on each alternative using the Independent Voting System. Since the outcomes do not affect each other, the votes can be taken simultaneously or sequentially. Score the votes after all of the votes have been taken. The highest positive score wins. If there is no positive, score, then no change shall be made. This procedure must always be used if there is a disagreement on what to do.